Meat The Butchers and Crowd Cow are designed to take the stress out of meal planning and this Meat The Butchers VS Crowd Cow comparison is designed to make it much easier to choose between them. Get a comprehensive overview of these companies’ crucial features and scroll down to discover the definite winner of the comparison. Crowd Cow sells one cow at a time, ensuring optimal freshness and flavor. Order as much meat as you wish, whenever you want, or subscribe to get regular deliveries of pasture-raised ground beef. Crowd Cow has limited its selection to high-quality beef, pork, and chicken. It offers over 100 different cuts at all times, ranging from New York strip steak to cow tongue and chicken feet and liver. Crowd Cow brings you 100% grass-fed beef, pasture-raised, grain-fed beef, Japanese A5 Wagyu beef, pasture-raised heritage pork, and pasture-raised chicken. Crowd Cow only sells meat. Crowd Cow obtains meat from family-owned farms and ranches across the country, which are carefully vetted to ensure they employ the best sustainability practices. The company provides plenty of details on each of its partner farms and ranches, so you can make an informed purchasing decision. With Crowd Cow, you can opt for one-off orders with no minimum value or subscribe. The company offers flexible subscriptions, allowing you to speed up or postpone your delivery and cancel your subscription at any time. If you are not satisfied with your shipment, get in touch with Crowd Cow's customer support staff within 7 days. You may receive a replacement or a full or partial refund, depending on the circumstances. Crowd Cow charges $12.99+ for shipping. The costs vary depending on location. Crowd Cow ships all over the continental US. Really good but too expensive. Great idea and even greater product. My father was a rancher and I know how hard it can be, services like these are much-needed, not only because it’s so hard to get healthy meat but because they actually help ranchers, which is a big plus in my book. We don’t order often because we are trying to eat less meat, but when we do crave good beef, we get it from crowd cow. It’s not cheap but it shouldn’t be, this is real meat from real farms, not some mass-produced, stale meat made from tortured animals. 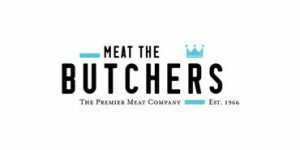 Meat The Butchers is a meat delivery service that offers nothing but the freshest premium meat and seafood. Its offer includes over 70 different cuts, all sustainably sourced, completely natural, and freshly delivered from the best local farms. Find out how you can get your hands on some of the best meat in the country in this Meat The Butchers review.